BAU 2017—that is 185,000 square meters of materials, technologies and systems. Some 25 soccer fields of state-of-the-art technology for the international construction industry. In a five-part series, we look at the main focuses of the exhibition sectors at the fair. Part 3 deals with the topics of glass and building automation/control, natural/cast stone and stones/soils. A “smart home” consists of more than just intelligently controlled heating systems, smart windows and smart facades. Developments in the sector for transparent building components have seen a number of innovations, especially during the past few years. Facades are now high-tech products that can perform actual energy miracles in conjunction with the glazing. One example is the “Aktiv-Stadthaus” by HHS Planer + Architekten (Kassel) that officially opened in Frankfurt am Main in 2015. 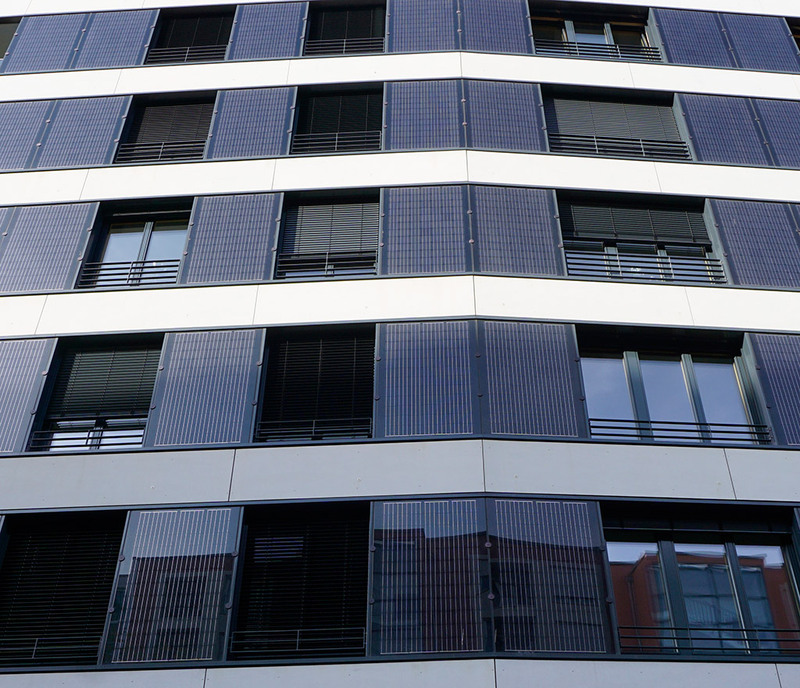 As the largest plus energy residential building in Europe, it features a perfect combination of passive efficiency using insulation (north side) and active energy generation (south side). Besides intelligent and media facades, the focal points of BAU 2017 will also include solutions for energy-generating systems, lighting control and protection against the sun, heat and noise. The latest developments in glass building materials, foils, glass structures and elevators will also be presented. A special show by ift Rosenheim titled “Quality follows Function!” will examine current standards, laws and testing techniques as well as their effects on design and materials. A variety of potential uses, durability and special aesthetics make stone a timeless and popular building material. Its myriad of colors and technical properties make it possible to use stone both indoors and outdoors, as a facade cladding, floor covering or even as furniture. Modern processing methods and computer-controlled processing centers make it possible to create a diverse range of surfaces that use grooves and profiles to produce unique light and shadow effects. That is also underscored by a project that won the 2015 German Natural Stone Award (DNP), i.e. the Berlin high-rise “Zoofenster” hotel by Christoph Mäckler Architects. The 120 meters high building complex is almost completely covered in limestone, which gives it the appearance of a homogenous unit despite its structure. Once again, Deutsche Naturwerkstein-Verband e.V., which confers the DNP Architecture Award every two years, will have a joint exhibit with several participating member companies in Hall A4 at BAU. This sector features information on a wide range of materials and applications—from sand-lime brick, concrete/porous concrete and pumice/fiber-cement building materials to plasters, screed, insulating materials as well as facade systems, dry interior finishing and prefabricated building. The topic of concrete will be a separate focal point, just as it has been in previous years. At a joint stand with 1,000 square meters of space, the exhibits of InformationsZentrum Beton GmbH and its 12 partner companies will focus on the latest developments that pertain to the topics of sustainability, energy efficiency, design and innovation. “Once again, the joint exhibit under the umbrella brand 'concrete' will demonstrate the diverse range of applications and design possibilities that this building material has to offer,” emphasizes Ulrich Nolting, Managing Director of InformationsZentrum Beton. Special attention will be given to drainage concrete, an open-matrix concrete that is used as a surface layer for drainage and to reduce noise in road construction. The new design atlas for building construction will also be introduced. Other focal points include ways to activate the concrete core and design alternatives for exposed concrete. Last but not least, visitors can look forward to a new attraction in the field of 3D printed concrete, which is the result of collaboration with TU Munich.